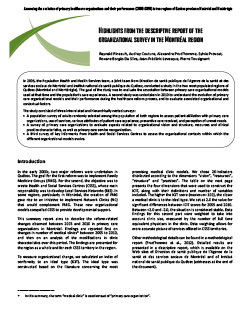 This summary report aims to describe the reform-related changes observed between 2005 and 2010 in primary care organizations in Montréal. Findings are reported first on changes in number of medical clinics between 2005 to 2010, and then on an analysis of the modifications in clinic characteristics over this period. The findings are presented for the region as a whole and for each CSSS territory in the region. In the region, we observe a decline in the number of primary care medical clinics between 2005 and 2010; this decrease, mostly due to small (mostly solo) clinics closures, was compensated by merges and the spread of larger clinics, and especially by the marked increase in FMG, NC and FMG-NC. There was also significant improvement in the index of conformity to organizational ideal type (ICIT) between 2005 and 2010. This improvement is due mostly to the implementation of FMG and NC in existing clinics. Given the nature of these changes, we find that ICIT scores for the dimensions “structure” and “resources” are the ones that changed the most. The same pattern is observed for CSSS territories in the region, but with greater variability. For instance, CSSS Cavendish reports a significant increase in overall ICIT score (+10.7), due mostly to the dimensions “resources” (+16.2) and “structure” (+14.3). This change can largely be explained by numerous medical resources moving from the de la Montagne to the Cavendish CSSS territory. Moreover, CSSS du Sud-Ouest-Verdun and de Bordeaux–Cartierville– Saint-Laurent, which had high ICIT scores in 2005, registered the highest increases between 2005 and 2010. To conclude, major disparities can be observed in 2010 among CSSS territories in the region. This marked variability reflects the territories broad diversity in this urban region, and is an indication of its distinct character.